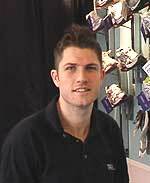 Tom graduated from the University of Brighton in 2001 in Podiatry and is continually updating his knowledge. He is currently studying for a Masters Degree in the Theory of Podiatric Surgery. He has worked within the National Health Service for a number of years gaining experience with a wide variety of patient groups. Within his career he has worked with the Ministry of Defence, provided a number of various lectures and presentations to various professions including Medics, Physiotherapists, Podiatrists and Sports Massage Therapists. He now works as an independant Podiatrist at a number of locations as well as teaching as a Clinical Educator for The University of Brighton on the undergraduate Podiatry programme. Tom works with members of the general public to elite and professional sports people. Helping them be more comfortable, reduce pain and improve performance in their chosen activities. New Balance UK, Gillingham FC, Kent CCC. The Brighton Marathon, The London Marathon, The Commonwealth Games, Glastonbury.